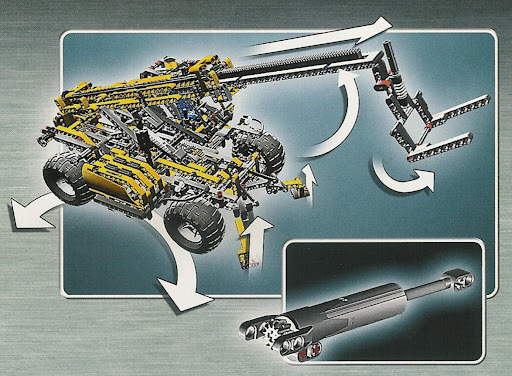 I've just got a new catalog, where some old images from the new 2H TECHNIC sets are available. So I can saw them with more detail. It turns obvious when you compare with the setup on the right, where a '12 Thoot Double Bevel' gear is in use. Regarding the Off Roader (8297), it has written a sentence which translated means "Doors and Bonnet with hydraulic opening". It seems Ok and according to the images available for the doors, but I doubt it would be the case for the capot or even the rear door. 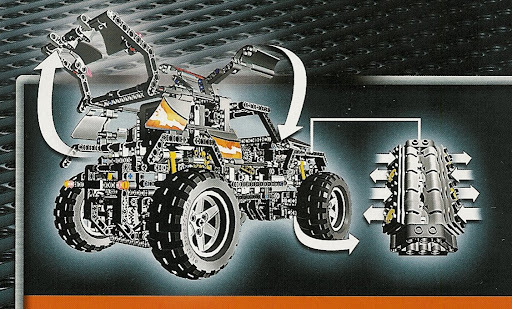 From the originally sized images, it is also clear that tires are in fact '94.8 x 44 R' sized, i.e. the same used at rear wheels from the 2006 'Tractor/Dune Buggy' (8284). It would be a serious design flaw (even more serious than the one on the PF receiver, since that one wasn't obvious to the eye), to have that limitation when it could be so easy (so easy that it got actually done) to have something more universal! I thought about wether an axle hole (like current motors), instead of an axle (like old motors) would be better, but I think not: due to the design of the LA, made to articulate around the holes in its support, I doubt anyone will need to plug in it a long axle. Also, from the new, more detailed pic of the Excavator, I see it has a Technic Gear 20 Tooth Bevel directly driving what appears to be the 12 tooth gear in the bottom LA. 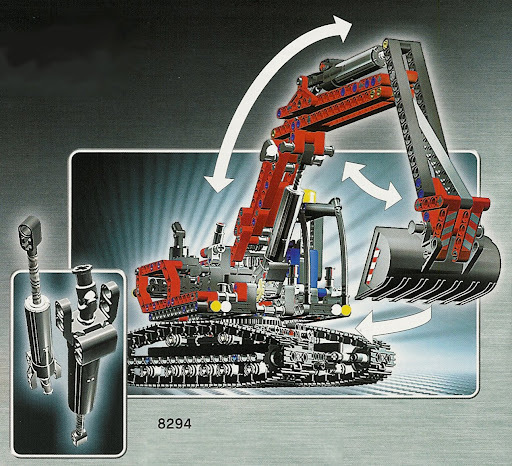 That results in an increase of speed just before the LA that raises the whole excavator arm! So, the Linear Actuator must be a really strong mechanism. Nice. Seriously, hopefully the LA design is stronger than the gears driving it (so you'll strip gears before you break the LA).